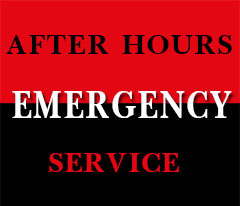 We offer a 24/7 emergency after hours service. A minimum two hour charge at penalty rates applies for all weekend and after hours call outs. Quite often faults can be located to an appliance and can be isolated over the phone avoiding unnecessary costs to our customers, with repairs to be conducted on the next business day. For all after hours callouts please call us on 0458 710 111.